We welcomed a new addition to our family today. I'd mentioned in passing to Mr. Monkey awhile ago that I really wanted a little boy, but there were no more boys, so he brought home this little girl instead. "Pink Melody" isn't my coveted "Rhythm & Blue," but I do prefer it over "Bohemian Brown," which was the other option available, so Mr. Monkey did very well. Buh-bye, old bulky point-and-shoot! I have a new pink baby for my purse now! If you'd like to add to your family, go to Fry's. My little girl cost only $199 and came with a free 2GB secure digital memory card. Score! She totally has your smile, too! congrats on the new baby! i have a boy myself :-). Hurrah! 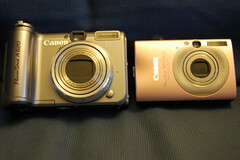 I had noticed at the blog party forever ago that your point and shoot was kinda bulky. I may have to go check out Fry's. I don't even have a camera of my own. You got a much better deal on pricing though. i miss my camera. the new one doesn't compare. Ooooh nice! 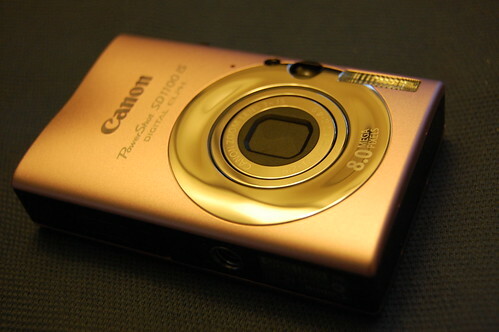 I love my Canon point-and-shoot too.